Sony today showed off the Xperia XZ smartphone, a high-end follow-up to the Xperia X series devices from earlier this year. For the XZ, Sony said it concentrated on improving the camera and video camera performance, as well as further refining its design language. The XZ features what Sony calls the "loop" design, which relies on a seamless polycarbonate frame, glass display, and metal back plate. The screen measures 5.2 inches with includes 1080p full HD resolution and Gorilla Glass 4. The XZ is powered by a Snapdragon 820 processor with Adreno 510 GPU, 3 GB of RAM, and 32 GB of storage. The main camera has a 23-megapixel Exmor RS sensor with a variety of technologies added to help the phone take better pictures. It uses triple image-sensing and predictive hybrid autofocus to capture sharp images. It relies on electronic image stabilization and delivers 5x digital zoom. The video camera's SteadyShot feature measures 5-axises of movement and captures 4K video. The 13-megapixel selfie camera has an aperture of f/2.0 and a wide-angle 22mm lens. Other specs include CAT9 LTE; 2,900mAh battery with Quick Charge 3.0 and Qnovo adaptive charging; high-resolution stereo audio capture and playback; and IP68 certification for protection against water and dust. It runs Android 6.0 Marshmallow and will come in forest blue, black, and platinum. The Sony Xperia XZ will be sold to U.S. consumers unlocked beginning October 23. Pricing was not disclosed. Sony today discussed pricing and availability details for the Xperia XZ and Xperia X Compact (pictured) smartphones. 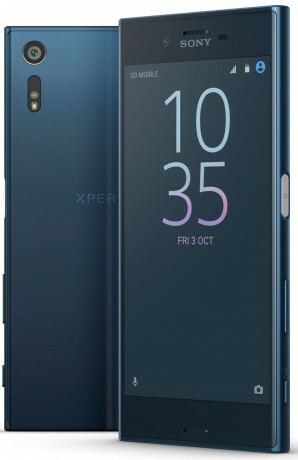 The XZ will cost $700 and it goes on sale via Amazon and other online retailers October 2. Sony today said it has begin distributing the Android 7 Nougat operating system to its Xperia XZ and Xperia X Performance smartphones. The platform includes multi-window support, longer battery life, more messaging options, manual camera controls, and a revised home screen experience that includes Google Now.